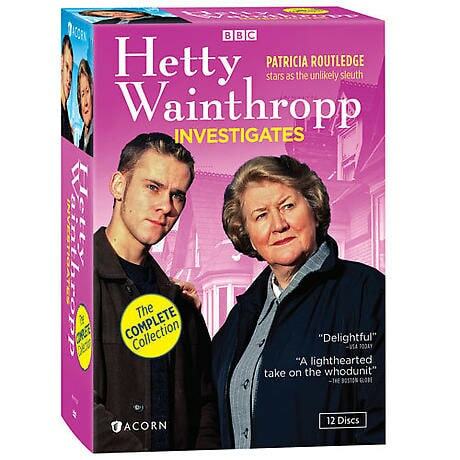 Acclaimed actress Patricia Routledge (Keeping Up Appearances) brings her genius for wry comedy and warmhearted drama to the role of housewife-turned-private-investigator Hetty Wainthropp. Like an earthier Miss Marple, Hetty applies her seasoned intuition and fierce moral compass to the job of righting wrongs in England's towns and villages. With the support of her teenaged sidekick, Geoffrey (Dominic Monaghan, Lost, The Lord of the Rings trilogy), and devoted husband, Robert (Derek Benfield, Rumpole of the Bailey), she grows from a most unlikely sleuth into an experienced and respected detective. This collection captures Hetty's entire sleuthing career in one complete set-including episodes not seen on the PBS Masterpiece Mystery! broadcast. Her old-fashioned common sense and unfailing compassion make Hetty a detective to be reckoned with-and to cherish. 27 episodes, 12 DVDs, approx. 22½ hours, SDH. At 60, Hetty refuses to become a sedentary senior citizen. She wants to count for something and make some money, since she doesn't have a pension of her own. A job at the post office-and her keen powers of observation-awaken her gift for sleuthing. A young man who can neither hear nor speak disappears, and his frantic parents turn to Hetty for help finding him. Is it significant that he disappeared on the day he was to meet his mail-order Thai bride? The owners of an Italian inn receive a horrifying package and fear for the safety of their son, who is studying English in Manchester. Luckily, one of the inn's guests is the vacationing sleuth Hetty Wainthropp. Hetty and Robert travel to Readsby, a small village where Robert's revered uncle, a former professional soccer player, has apparently committed suicide. But Hetty doesn't believe it was suicide and suspects the involvement of some sinister villagers. A mother concerned for the welfare of her mentally ill son hires Hetty to find him. Frustrated when her search runs dry, Hetty determines she must forget logic and try to get into the young man's disordered mind. Hetty looks for a troubled teen with a history of setting fires who has disappeared amid a series of local arson attacks. A newspaper photo provides an unlikely break, and Geoffrey dresses in drag to wrap it up. Suspicion and fear pervade a local village after residents begin receiving anonymous letters containing threats to expose their darkest secrets. The prime suspect, a self-described "repressed spinster," hires Hetty to clear her name. When contestants at the Blainthorp Music Festival begin losing their singing voices, the sponsor hires Hetty to find out why, but she has to work fast. She only has five days to save the festival. The mayor of Titterslow wants Hetty to find his missing daughter, but the mayor and his wife insist that the investigation be kept quiet: no publicity and no police. It soon becomes clear where the girl was headed but not why she never arrived. To expose a spiritualist she suspects of preying on the recently widowed, Hetty goes to a seance undercover, inventing a dead husband she hopes to contact. She begins to believe, until a woman shows up claiming to be her invented husband's daughter. The children of a well-to-do widow hire Hetty to investigate their mother's fiance, an apparent roue they worry is only after her money. As she delves into his past, Hetty makes discoveries to both support and refute their suspicions. When an insider leaks the location of a secret women's shelter, a fatal attack ensues. Sent to the shelter as an undercover agent, Hetty learns the terrifying realities of spousal abuse and rallies the women to defend themselves. A teenage pyromaniac is terrorizing a neighborhood, but the police are stymied by frightened victims refusing to testify against him. Posing as the Irish sister-in-law of one of the residents, Hetty infiltrates the local quilting circle to get the lowdown. A military wife hires Hetty to identify a mysterious photographer who is stalking the woman's daughter and the daughter's fiance. Tipped that an Australian is involved, Hetty and Geoffrey go undercover as "Aussies." A leader of the local Indian community recruits Hetty to investigate a string of muggings, and then Hetty herself is mugged. The plot thickens when Robert becomes the unwitting recipient of stolen goods. After a minor fender-bender involving two women, one attacks the other and then zips off in her red Alfa Romeo. The battered victim asks Hetty to help identify her assailant. Geoffrey tracks down the Alfa and a witness. A quick visit to relatives turns into a longer stay for Hetty when her young nephew gets expelled from school for drug possession. Sure the boy is being framed, Hetty enlists Geoffrey to infiltrate a gang led by a schoolyard bully called Bomber. Hetty gets hired to track down a bankrupt furniture-store owner who has bilked her neighbor. Hetty's meddling brother-in-law, Frank, has come to stay and insists on "helping" in the agency while Robert is visiting their son in Australia. While Hetty is in the hospital for treatment of her varicose veins, DCI Adams is there keeping an eye on an ailing prisoner. Hetty goes into action from her hospital bed when a young nurse accuses Adams of sexual harassment. A German pensioner asks Hetty to track down his sister, whom he last saw during the war as she was escaping to England. When Hetty visits him in the residential home where he lives, she discovers that Hansi has a more urgent problem. Frank finally takes his leave and treats Hetty to a day out on a local steam railway as a parting gift. A frantic call from a client who believes he is in terrible danger makes it a working trip. A miner's widow in Cumbria enlists the agency to find a missing book penned by her late husband. But is she really after a book or a map to hidden treasure? To investigate a suspicious drowning, Robert poses as a wheelchair-bound millionaire and Geoffrey as his chauffer. With Hetty working behind the scenes, they uncover a hidden identity and dark motives for murder. A reclusive senior barricades herself inside her condemned building to block a real estate deal. While investigating the woman's claims of fraud, Hetty discovers something suspicious about the building itself. The husband of Hetty's hairdresser refuses to press charges after suffering an unprovoked beating. Hetty agrees to find out why and starts by enrolling Geoffrey in the gym where the attacker works. Meanwhile, Robert gets a mission of his own. While visiting a long-lost cousin in a remote village, Hetty takes on the case of an elderly woman who hears strange sounds in the night. The villagers believe demonic spirits are at work, but Hetty and Geoffrey discover an earthly explanation. Frank asks Hetty to find an old girlfriend's daughter, who has disappeared from her new job at a Victorian living-history museum. To clear up all the mysteries, the detectives themselves must don period garb to investigate.